Mabini is a 1st income class municipality on the Calumpang Peninsula in the Province of Batangas. 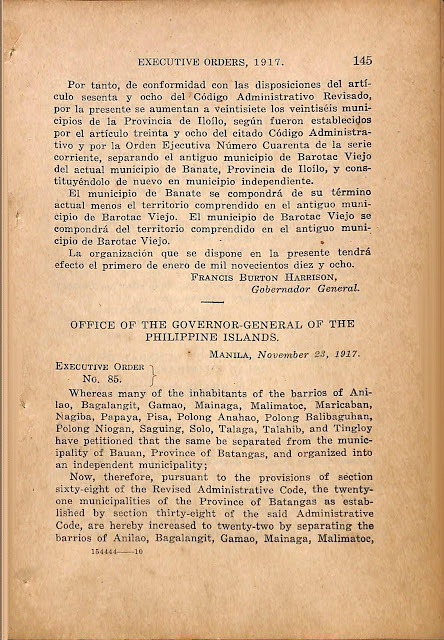 It used to be part of the larger town of Bauan until formally created on the 1st day of January in the year 1918. In the present day, it has a land area of 44.47 square kilometers and a population of 46,211 as per the 2015 Philippine Census1. 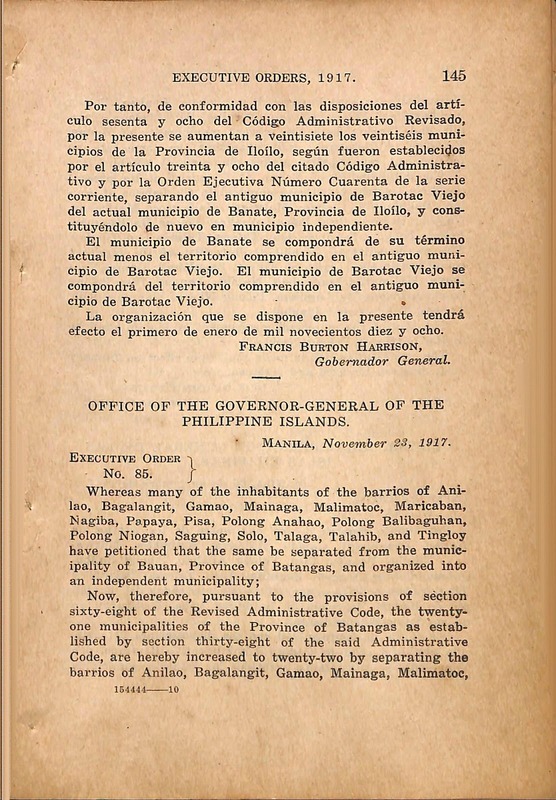 The municipality of Bauan shall consist of its present territory less the territory comprised in the barrios of Anilao, Bagalangit, Gamao, Mainaga, Malimatoc, Maricaban, Nagiba, Papaya, Pisa, Polong Anahao, Polong Balibaguhan, Polong Niogan, Saguing, Solo, Talaga, Talahib and Tingloy. 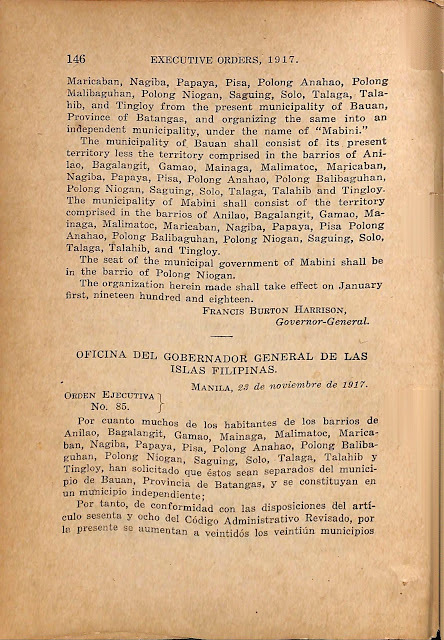 The municipality of Mabini shall consist of the territory comprised in the barrios of Anilao, Bagalangit, Gamao, Mainaga, Malimatoc, Maricaban, Nagiba, Papaya, Pisa Polong Anahao, Polong Balibaguhan, Polong Niogan, Saguing, Solo, Talaga, Talahib, and Tingloy. 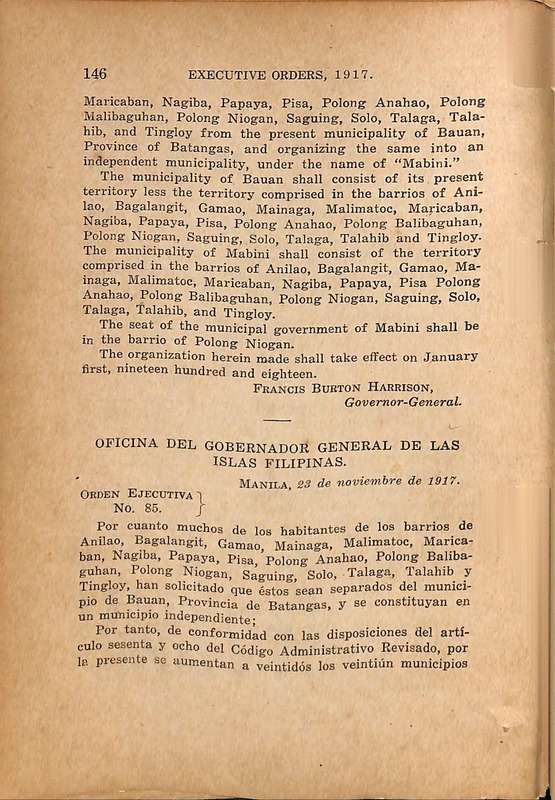 The seat of the municipal government of Mabini shall be in the barrio of Polong Niogan. The organization herein made shall take effect on January ﬁrst, nineteen hundred and eighteen. Executive Order No. 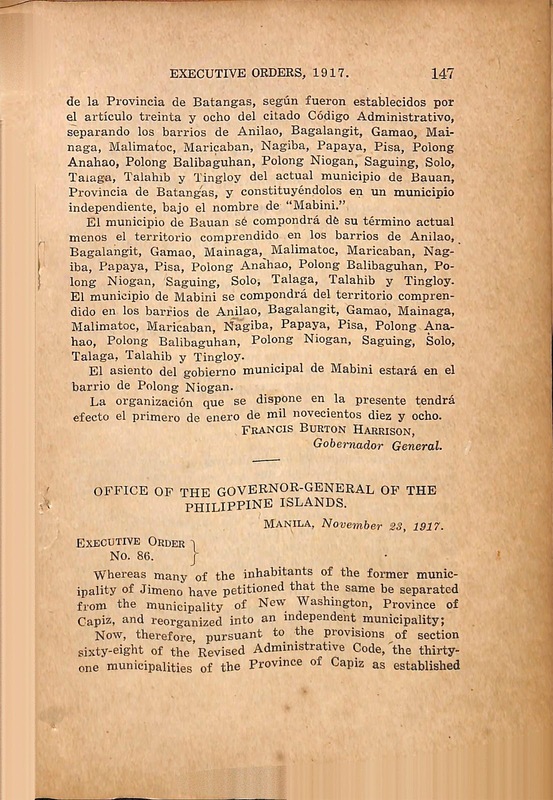 85 series of 1917 creating the Municipality of Mabini, Englsh version. Executive Order No. 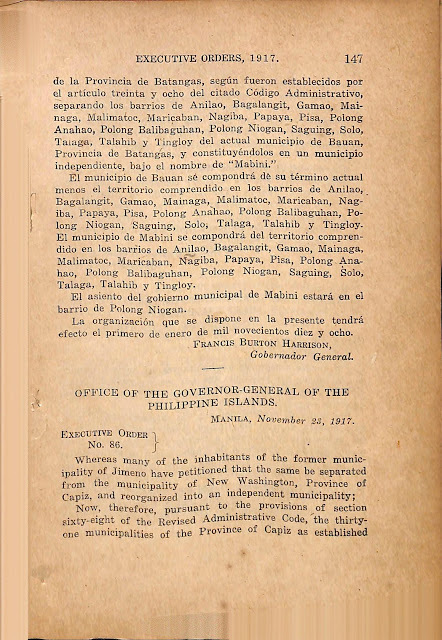 85 series of 1917 creating the Municipality of Mabini, Englsh and Spanish versions. 2 “Executive Order Nos. 1-113 (1917),” online at the Internet Archive.